I am beyond excited to have found Facebook Blocker. As you might guess, I am not fond of all those like buttons popping up on every site in the internetz-universe. When I discovered the first Facebook Like Button over on Apple, I nearly fell off my chair. Here’s a brand, Apple, that I thought would *never* implement a Facebook button. I guess I was wrong. Obviously I am not the only one that would love to see the web with less of those blue thumbs up buttons. 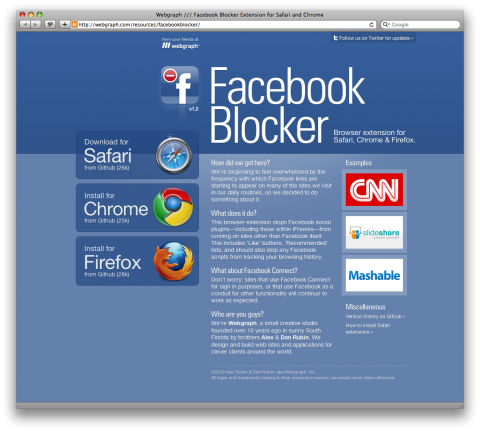 So, a big thank you to Webgraph for having created the Facebook Blocker. This browser extension stops Facebook social plugins—including those within iFrames—from running on sites other than Facebook itself. This includes ‘Like’ buttons, ‘Recommended’ lists, and should also stop any Facebook scripts from tracking your browsing history. Don’t worry: sites that use Facebook Connect for sign in purposes, or that use Facebook as a conduit for other functionality will continue to work as expected. Go to this page: http://www.apple.com/itunes/ Scroll down. Like Button, right there. This is the best! I haven’t been to Mashable in a long time precisely because of the overwhelming connections to facebook. Now the site is almost nice to look at! I’m mostly excited to not have facebook track my browsing history or access my account silently when I’m on other sites. omg this is amazing thank you. I’m a web designer and love all things web yet I loathe those facebook like buttons! This makes me realized how much I actually hate the like button too. It kind of creeps up on you. I don’t ‘like’ being on another website and seeing the like button, its another reminder that maybe I should check my Facebook. There’s not many things I would like that I would want to share with people on Facebook. I lied, there are many things that I like but I don’t think Facebook is the platform for that. I’d rather use Twitter to RT something. The fb like button is really so small though, i can’t really see the point of this but each to their own, should be popular with the hipsters as i’d imagine fb has gotten way to popular now. If you already use something like AdBlock Plus (Firefox), you could also just right click & block the FB iframe/content, and it would carry across all sites. Yeah because sharing stuff is bad and not what the internet is about. Interesting article. Genuinely my first reaction was to look for the Twitter share button so I could post for some industry friends. This seems like more of a statement than an actual functional thing. If you dont want to share on facebook dont share? but why would you disconnect yourself with the reality of the state of the web as it exists for everyone else. Especially if you are in any way involved with design or web development? Reminds me of how my dad has refused to get a mobile phone for the last 10 years. and now he needs one, but they confuse him because hes excluded himself for so long. Thanks Tina! We’re glad you ‘like’ it *cough* enough to share with everyone. For anyone wondering: The extension isn’t just an attempt to hide the little blue button (though for some of us, the aethetic improvement would be enough), but to help prevent the collection and tracking of your browsing habits by Facebook, which to some is quite disconcerting (even if you use Facebook.com, which we do). Facebook Blocker does its best to prevent the remote scripts from loading at all, rather than simply hiding the end result (e.g. Like buttons, lists, etc.). So, does this disable the FB cross domain tracking? Rephrase: does this disable the entire domain access for the like widget, disabling contact with that widget? Or does it just hide it? @Will K: Yes indeed, we try our best to disable the scripts before they have a chance to load (e.g. we attempt to prevent them from loading at all). Because of this, our attention is focused on the scripts that come from Facebook itself, rather than from individual host sites: e.g. ABC.com has their own Facebook-related sharing scripts, which we don’t block — this pattern can be seen on many sites these days, using custom scripts instead of using scripts provided by Facebook. I don’t wanna get hectic to use some tricks that probably will crash my computer. I only installed FBBlock and it works !